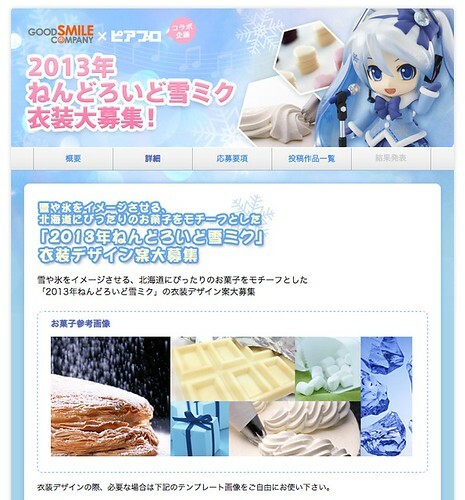 Similar to last year, GSC and PIAPRO set up a Costume Design Contest for Nendoroid Snow Miku: 2013 version. While the theme for last year’s costume was jewellery and crystal, this year’s emphasize is sweeteries, such as cakes, candies, and tarts. Obviously, since this is a design for SNOW Miku, those sweeties should have a snow or ice theme embedded into the design. The contest has started since yesterday, and the deadline has not been announced yet. If you are interested to participate, you might want to see further details on the source links below. This entry was posted in News and tagged gsc, hatsune miku, nendoroid, piapro, snow miku, vocaloid, yuki. Deadline is on the 30th of May, it says there. There’s no limit on your age and if you’re a professional/amateur artist. Although there’s not a single word if they only allow Japanese residents.